Quick has been providing its youngest visitors with playing fun with its Magic Box and its Fun Box for a long time now. However, Quick wanted to enrich this experience with a digital component. They found the perfect partner in Cartamundi Digital to set up a hybrid promotional campaign in which cards can be collected that unlock a digital experience. 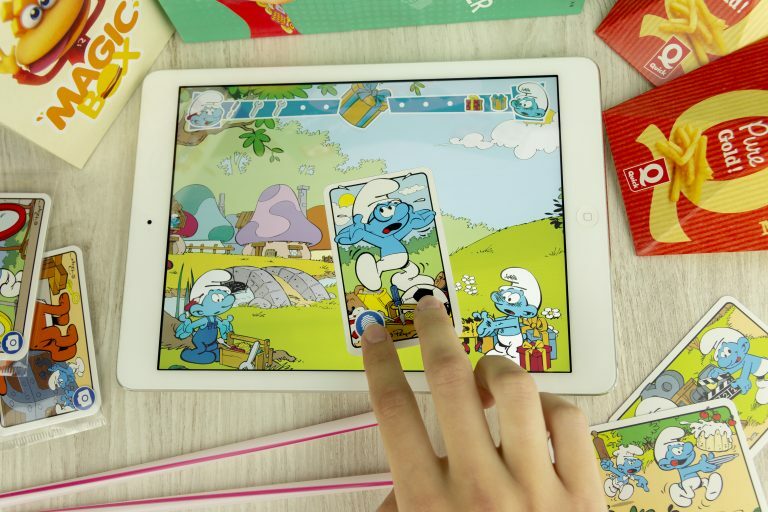 Because Quick also wanted this campaign to emphasise its Belgian character, Cartamundi Digital immediately thought of the Smurfs. 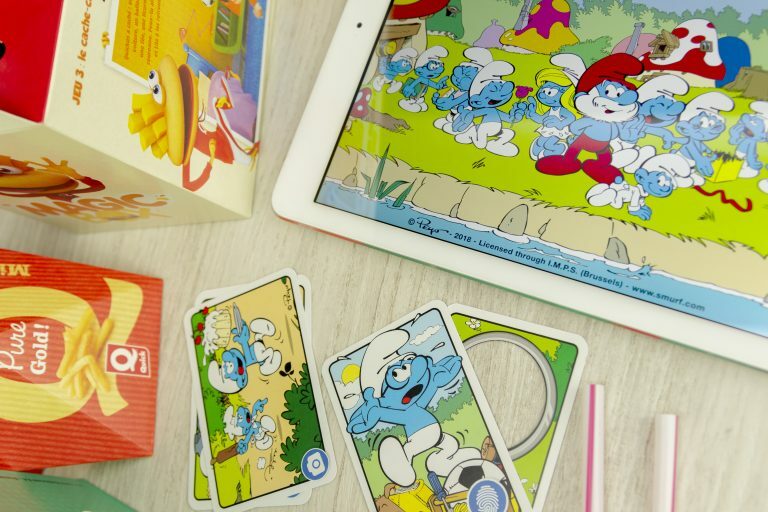 Cartamundi Digital combines the cards that are distributed in the Magic Box and the Fun Box with digital games. By scanning a card, players can gain access to a game in the “Gesmurft” (“Smurfed”) app via image recognition. The app can be downloaded free of charge from the App Store and the Google Play Store. We developed four games for the Magic Box and another four for the Fun Box in total. The cards in the Magic Box allow the very youngest to access simple games, which can be played over and over again very easily. Some games require players to actually have one of the cards. There is, for example, a sorting game in which the player has to use a card to move objects to one of the two Smurfs to whom the object belongs. There is also a running game, in which a Smurf runs on and on in front of the moving background of a pop-up book. In this visually attractive environment the player helps the Smurf avoid obstacles, collecting rewards en route. In the Smurf Theatre, players can create a number of backdrops, attributes and Smurfs and, by doing so, create their very own Smurf Story. By swiping across the screen, Smurfs and items can be moved about, while the child takes on the role of a narrator. The app records the narration, so that the child can watch his or her own story again with others. 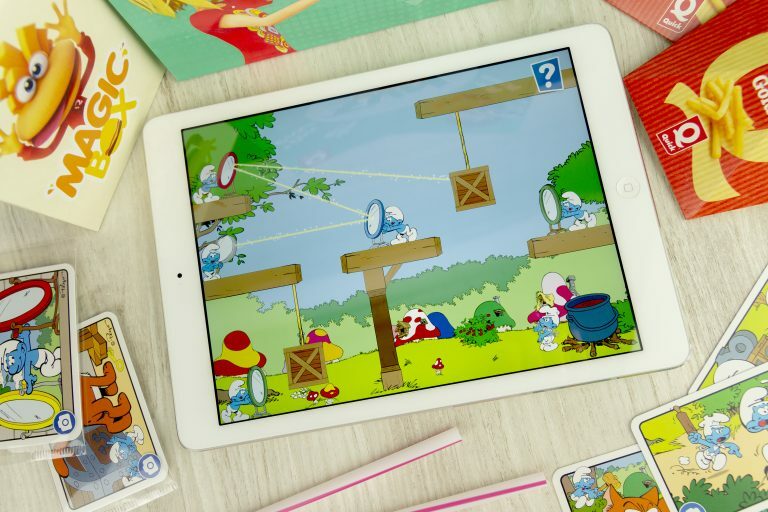 Cartamundi Digital also developed four fun games for the Fun Box that require a little more dexterity. They are challenging enough for children between the ages of 8 and 11, who are guaranteed to play them over and over again. In the Mirror Game, a ray of light is projected across the screen. The player has to arrange a number of Smurfs with mirrors in their hands in such a way that the reflection of light ultimately creates a fire. Obstacles through which no light can pass and which need to be avoided have, of course, been placed in between the Smurfs. There are five levels in all for extra-long gaming fun. In the Escape game, the players have to guide a Smurf to the exit of a room. They will need to help the Smurf collect a number of objects on the way, like a key. The cat Azraël is also lurking about, but as soon as he sees the Smurf the game will be over. To win the game, the Smurf has to reach the exit, in possession of the key. 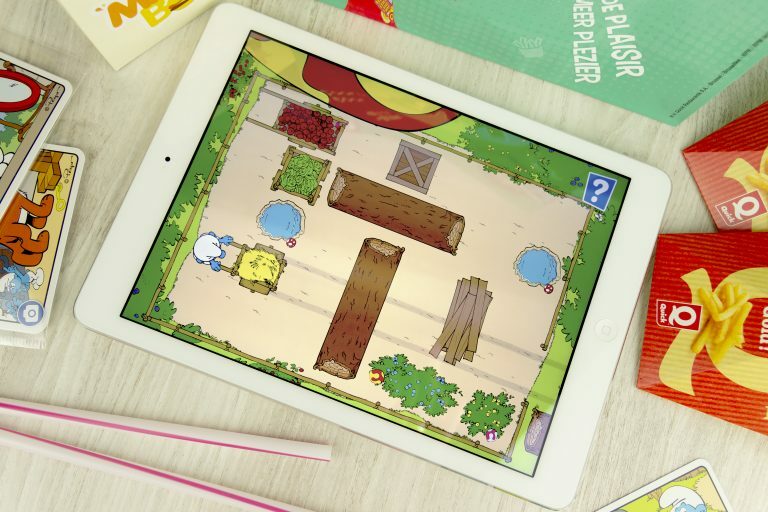 An additional challenge is presented by a number of Smurf berries that can be collected. Cartamundi Digital came up with the concept of the cards that unlock eight games for Quick, and of course also developed these games. In addition, we also provided advice with regard to the licensing rights so that the Smurfs could be used as figures in the games and featured on the cards, in which we acted as a liaison with the licence holder. This project enabled Cartamundi Digital to initiate a unique partnership between two well-known Belgian brands. Are you looking for a unique way to playfully put your brand or product in the spotlights? Don’t hesitate to contact us!